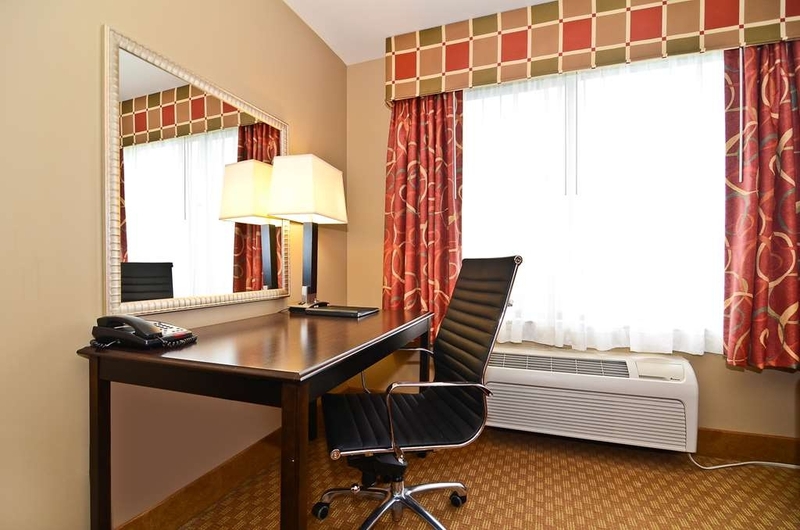 Il Best Western Chicago Southland è situato nel centro di Oak Forest. L'hotel è vicino alle principali attrazioni turistiche. Approfittate tutto l'anno del miglior prezzo garantito e di offerte esclusive. 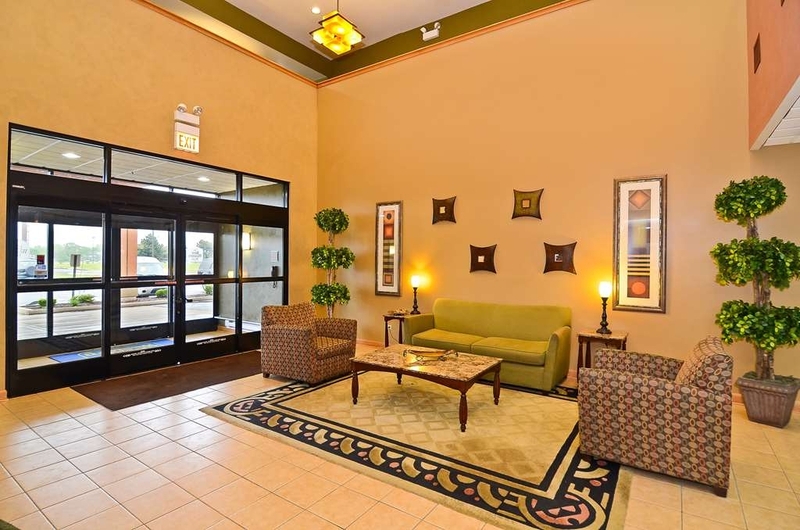 Benvenuto al Best Western Chicago Southland dove potrai trovare un ottimo servizio clienti e sistemazioni comode, accoglienti e convenienti. 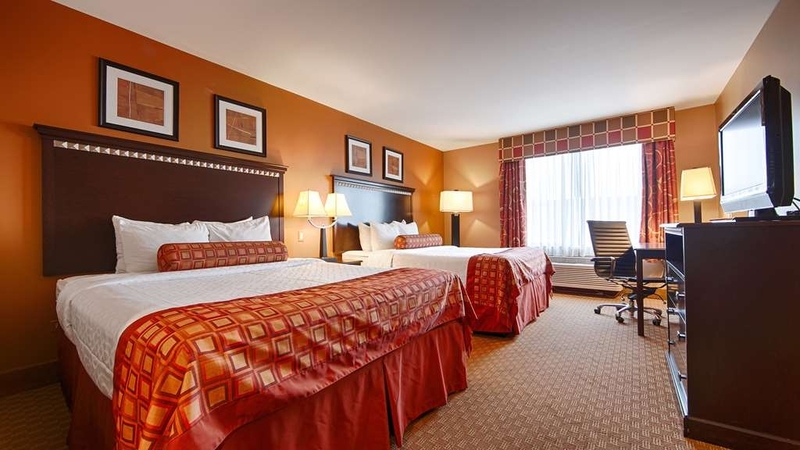 Dal Best Western® Chicago Southland potrai raggiungere facilmente numerose attrazioni locali, negozi e ristoranti di Oak Forest, Illinois, e dei dintorni. Il villaggio di Tinley Park, Illinois, e il centro convegno di Tinley Park si trovano nelle vicinanze dell'hotel. L'Hollywood Casino Amphitheater ospita spettacoli di livello internazionale ed è una delle attrazioni più visitate dai nostri ospiti. Il Chicago Gaelic Park, situato nella città di Oak Forest, rappresenta una vera e propria oasi di pace rispetto al trambusto della città. 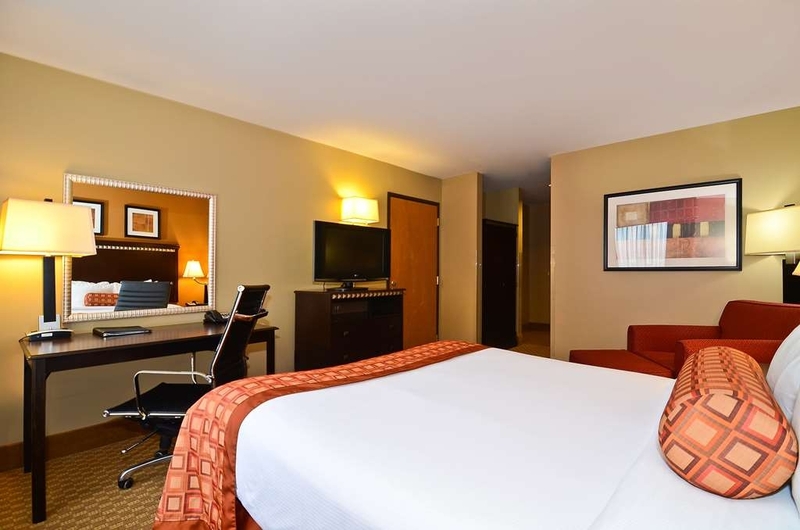 Questo hotel BEST WESTERN gode di un ottima posizione rispetto al centro di Chicago, trovandosi a soli 25 o 30 minuti dai ristoranti e dai negozi più centrali. L'hotel si trova in prossimità delle Interstate 57 e 80: potrai approfittare della pace di una zona periferica e raggiungere in pochi minuti il centro di Chicago. Potrai approfittare di numerosi confort, a prezzi incredibili. Le nostre camere sono dotate dei servizi più moderni. Non scordarti di gustare la nostra colazione gratuita, che comprende piatti caldi che cambiano ogni giorno tra cui uova, salsicce, crostini con sugo di carne e panini, nonché piatti serviti tutti i giorni, tra cui waffle, frutta, pasticcini, cerali caldi e freddi, yogurt, succhi di frutta ghiacciati e caffè 100% qualità arabica. Chi si trova in viaggio per affari potrà approfittare della nostra struttura per riunioni, in grado di ospitare fino a 50 persone, nonché delle nostre camere esclusive, ideali per chi soggiorna nella periferia sud di Chicago. I servizi standard di tutte le camere comprendono microonde, frigorifero, televisore a schermo piatto da 32 pollici e accesso Wi-Fi a Internet gratuito. La piscina al coperto, la vasca idromassaggio e la palestra sono alcuni dei servizi preferiti dei nostri ospiti. 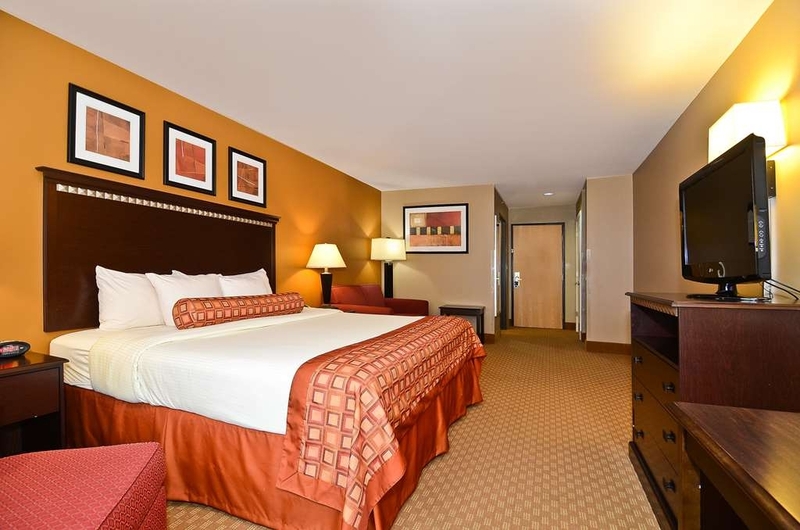 Per il tuo prossimo viaggio nella "città del vento" prenota una delle camere spaziose del Best Western Chicago Southland! "For $100 it was a good night sleep." After reading the reviews I agree that this hotel is difficult to get to and we drove through shady areas. However our parking was well lit and close to the lobby. The check in staff was polite and efficient. The room was clean. We slept good. The reviews about the empty ice machine and half filled pop machines were correct. The breakfast was one of the best I've had. The chef cooking omelette awas friendly and the food was delicious. I like this hotel. 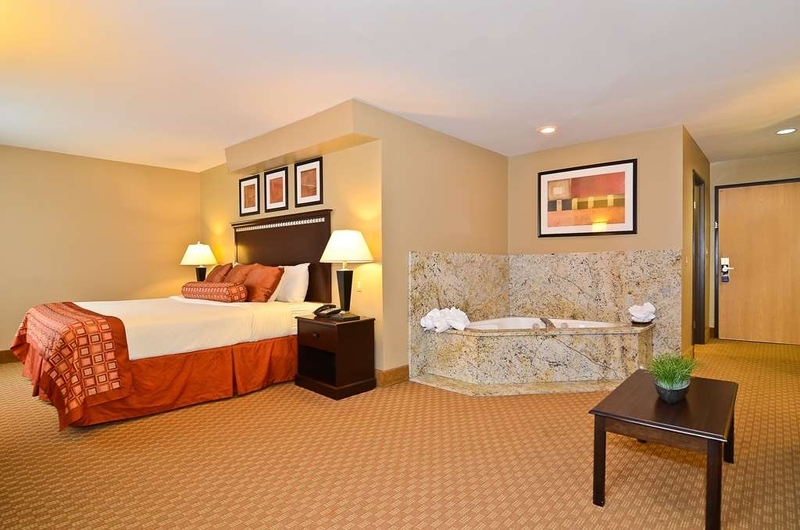 The rooms are comfortable, and it's been my experience that the bathrooms are clean with nice, hot shower water. The free breakfast is very edible with several options from eggs, bacon or sausage, biscuits, fruit, cereal . . . tasty! The rooms are a bit dated, but appears updating is underway. Nice place for sleeping and enjoying breakfast before hitting the road. We choose this room last min, for a family trip. 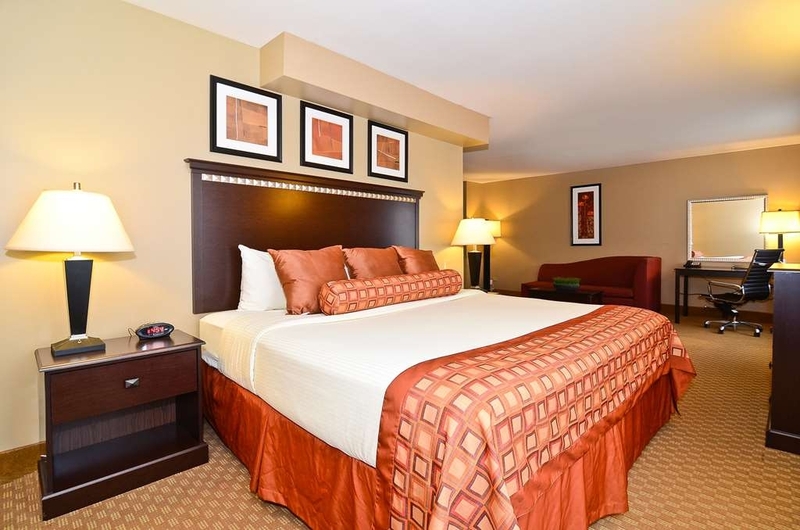 Overall it was a good experience, our room was very clean and comfortable. We were able to sleep in peace. no complaints there there was just a few things that I did not like. First the Wi-Fi information was not given to us at time of check in, the pool area had a very foul smell, kinda moldy. The free breakfast was good in the sense that they had plenty of options but it was quite cold and we were the first people there, also it had no seasoning at all, the food was so bland. "Strange place for a hotel"
It took a long time to check in. The elevator was not working the entire time we were there. They were putting in new carpet down the hallway we were staying on. It was a mess. We had to have help turning on the TV. Stayed one evening on a weekend. The hotel is on a frontage road, so it's a bit off the beaten path. It is currently undergoing renovations. We stayed on the second floor. The carpet was dirty and the room was showing signs of wear and tear, but again I assume it'll all be updated during the renovation process. The check-in process was easy and the hotel was very affordable. There was a lot of noise in the hallway until about 2 a.m. as the neighbors had booked a block of rooms and were going back and forth throughout the night and were pretty loud, but that's not the hotel's fault. This is just your average hotel. I've stayed in better but I've stayed in a lot worse! "Better Than a Truck Stop"
There aren't many places to stay in Southern Chicago, but if you can avoid this hotel, I'd try, at least for the foreseeable future. It's the little things: toilet seats not firmly attached (what a unpleasant surprise), heating/cooling units we couldn't control, TV remotes that didn't work (we went through 3), and really variable staff--some friendly & helpful and others sullen & clearly begrudging of our presence. But the room was clean and the breakfast quite acceptable. Good luck. "Very aged hotel with rude and unhelpful employees." After a recent stay, I was walking down the hallway to check out. I ran into a couple having trouble accessing their room. When I arrived at the front desk, I informed the clerk and another employee. Both employees refused assistance, indicating they "don't provide that service" and the couple should call housekeeping or go back downstairs. While there was, admittedly, a slight risk that the room did not, in fact, belong to the couple, the employees showed absolutely no interest in helping or finding out what the problem was. It was an inexcusable lack of customer service in an industry that relies on customer service. The hotel itself, though obviously aged and neglected, was fine for the price paid. The owner went out of his way to make sure I was comfortable. Went and bought a space heater, while the heater was being checked. Maintenance was there quickly and took care of the issues. It didn't interrupt my work that I needed to do. Very professional and respectful staff. They are undergoing renovations, so there were some obvious construction going on, but it was a good stay over all. Our first room was missing the tv remote and the light in the bathroom didn't work, but they changed our room quickly, so it wasn't much of an issue. Friendly staff. What a pleasant staff, very clean lobby, room was very comfy and warm. Toiletries were excellent and overall good experience. The hotel was quiet and clean. The bed was very comfy. The bathroom was immaculate. The Cable and internet were good as well. "It was ok, very loud neighbors." We were on the first floor and the neighbors were ridiculous loud above us. The room looked like they slapped some nice things on top of older things to keep it looking modern, the staff was nice though. "ok just to sleep at night"
Hotel was not as nice as the pictures show. Out side of the room hallway carpet not clean. Staff friendly. Pool not clean paint coming off water not clean. On the last night stay pool was cleaned no more paint coming off and water was clean and clear. Not worth the rate charged. "Hop from the South side to Water front"
Hotel is snugged away, just off Hwy.57 and only a short hop from the South side to Water front. Property felt secure and is well lit. Use street directions on approach. Nick's food is near by, on Oak Park Ave or will deliver and they got it all. There was a glitch in the computer book online so I had to call the hotel. I was charged for a room on a night that I have no confirmation or paper trail saying that I booked for that specific evening. When asked about it, the manager said it was my fault for not having any documentation and nothing could be done because it was my fault that I didn't show up for the reservation on a day I didn't even know about. This hotel is not helpful, does not work with people, and has terrible customer service. "Sleep in car if everything around here is booked"
This hotel is terrible!!! Do not stay here. Front desk personnel wear jeans and t shirsts no uniform or name tag.Only hotel ever that was open when I got to it ( did not have to use key) My room had huge stains all over floor, walls had greasy looking stains, hole in closet door,alarm clock had an inch of dust, and hair hanging from lamp shade. Asked to change to a different room and was told they were booked. They found a king ( I needed a double) the room was not much better. Gave me a $50 credit for one night, not the 2 I was staying. Breakfast is gross- wet muffins, fake eggs. Overall, top 3 worst hotels I have ever stayed in. "One of the worst hotel experiences"
Recently stayed there and I think this was one of my worst hotel experiences ever. Lightbulb in the bedside lamp was burned out and front desk did not have access to get a replacement bulb for us. TV didn't really work. It was tuned to one channel and we could not change it via remote or by using the controls on the side of the TV. In the bathroom the hole for the shower pipe was too big and the shower pipe would move around if you tried to adjust the shower head. The holder for the hair dryer came completely out of the wall. The breaking point was when we returned from our days activities and found the door to our room not totally closed. Thankfully everything was intact-- nothing missing, but it was obvious that housekeeping didn't shut the door completely when they were finished. Have stayed in other Best Westerns with much better luck. "Took forever to get a room!" Check-In time for this hotel is 3:00pm. We arrived at 6:45 pm and had to sit in the lobby for 45 minutes while a room was cleaned. This was not an isolated incident. There were several other people trying to check in and had a long wait as well. The person at the front desk, I think her name was Pier, was nice but it really put her in a bad situation. This was the worst stay yet at this location. I complained about my room not being refreshed each day of my stay and had to ask for fresh towels. The door to the bathroom was dragging which made it hard to close the bathroom door. Food was left in the refrigerator from previous guest. We stayed here with a group on 5-19-18. It took 30 minutes to check in. Multiple rooms were not ready until several hours after check in time. The air conditioner in the room didn't work. There was no soap or shampoo. We didn't get enough towels. The hair dryer didn't work. The comforter had big yellow stains on it. They said the pool was under renovation but they were storing chairs in it. Need I say more. You can't make this stuff up. We will not be staying here again. I would not recommend it to anyone. Stayed here for a quick visit to Chicago and was pleasantly surprised! 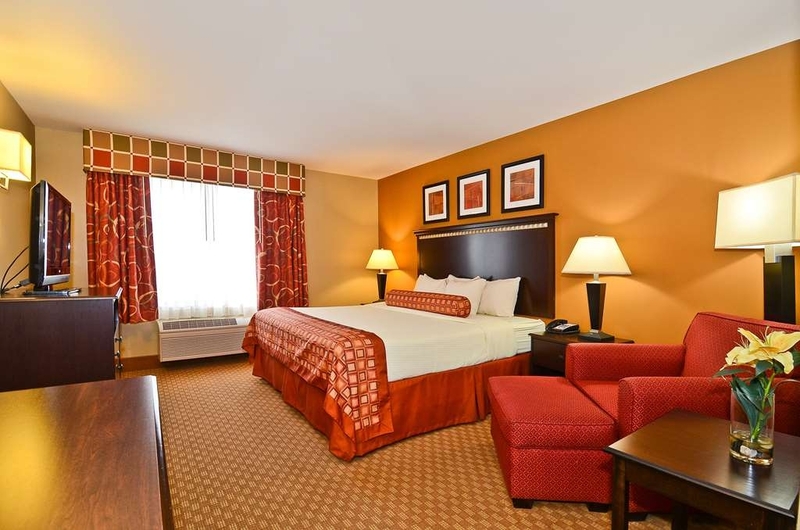 The rooms were clean and the staff was satisfactory. The breakfast was simply okay, but I did not expect too much. There are plenty of restaurants nearby, but the hotel is a bit isolated--it's a far walk, but definitely not a far drive to the main streets. Would stay at this hotel again. Staff was very friendly. Juan went out of his way to help us! The room was spacious and clean with 2 beds. It was clean and comfortable. The beds had 4 pillows each, clean linens/bedding. Comfy beds. Bathroom was clean, with ample room. Good amount of towels. Towels were fluffy and clean with no holes or stains. This location had and elevator. It also has plenty of truck/trailer parking. It was quiet! Good sized TV for the room with a nice TV line-up. Fridge and microwave worked well. HVAC unit work well too. We had several packages delivered and had no problem getting them from the front desk, with proper I.D. This location does NOT have guest laundry. If you are not from the area we suggest Bubble Buddy's. Ask the front desk for information. They offer delivery device, but we drove over there and did it ourselves. Overall we had a nice stay. We would recommended to everyone and stay again! The rooms were clean and staff was great BUT that pool was out of service. There are signs to say this is a 100% smoke free building and signage by every room that indicates it's a non smoking room. That didn't stop anyone. I have a HUGE problem when I leave my room and the hall is saturated with the smell marijuana to the degree that I had to place a towel under my door as I had traveled with a child and a pregnant women. I called the front desk to let them know how bad it was and I was told by the person that answered the phone that what someone does in their room behind close doors nothing can be done. Will not be staying here again. My Family's experience was not at all really satisfied because the pool water was green and out of order hot tub. And ran out of breakfast for at least 15mins. On the brighter side, rooms were clean and hotel is quiet. The only problem that we encountered was with the TV on our second day. The “backlight” went out. The staff quickly addressed the problem by replacing the television with another. Other than that, great room for the price! The access to the hotel was hard to figure out, lighting in the front area was bad (enter sign burnt out), the appearance in the lobby was good and the staff was very helpful. Restaurants were close and plenty of variety to chose from. The room has stained carpet, chairs, the bathroom was clean but it appeared as if the shower walls were going to fall in at anytime, drywall was rotted and discolored pulling away from the shower stall and holes in the wall around the bottom of the tub. I showered one morning and left the next day because of this. The breakfast was typical BW food, nothing good but the same at any BW I've been to.. I took four little girls for a birthday pool party, I rented a suite but had to LEAVE in the middle of the night because of BITES. The General Manager PAIGE is the worst. She said FIRST well we have to SEND SOMEONE IN NEXT WEEK TO CHECK IF ANYTHING IS THERE before we DECIDE on a refund amount. After ER visit MEDICATIONS (plural) I spoke to an attorney...lets just say she wished she would've just refunded me my money for that stay. "Visit to see grandchildren "
Hotel staff very friendly . Helpful. Breakfast was not that good. Cold food.Hotel was in need of Reno . Rooms were very rough condition. They are renovating so it should get better . Good central location . Easy access to highways and shopping is close by. Treated well by staff. Room dated. Bed not comfortable. Staff friendly . All good. Breakfast cold. Perfect location . Needs better beds and new decorating starting too look run down. Lose to the grandchildren . Thank you for your feedback on your previous stay with us. We apologize that our breakfast wasn't up to standard the morning you came down. We are currently undergoing some major changes of decor in our hotel and we would greatly appreciate if you would consider giving us another chance in the future to prove our excellent service. 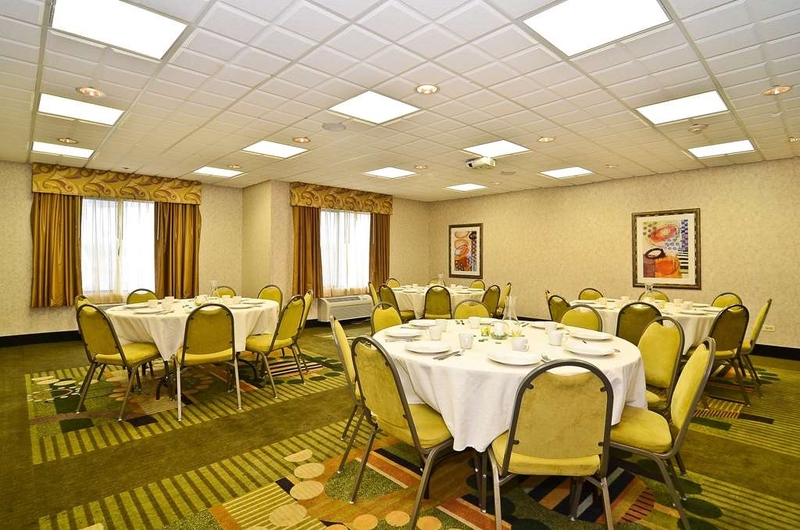 "Hotel In Oak Forest IL"
Thank you for your review. We're glad you had such a wonderful stay and we hope to see you again soon. We sincerely apologize for not exceeding your expectations during your stay. We are currently undergoing major updates in our hotel and we hope you would give us another chance in the future. We were quite surprised at how nice this BW was. Great young lady (daytime staff) .... The guy in the afternoon could use a "friendly" course LOL Everything else was great!!! Room, breakfast and pool was awesome. Hmm Hmm Hmm gotta love FREE cookies!!! We stayed at the motel for the NASCAR race weekend. About a half hour to the track. We enjoyed the stay. Rooms were nice and clean. Good shower, comfortable beds. Liked the quiet rooms the best. Access to the motel the least. Staff were exceptional. The room was very clean. Only the hall carpet needed cleaning, but I am sure it was due to renovating being done. Pool was a little cool but except for that the overall experience was great. Again, exceptional staff! "Stayed here before not again"
I was very disappointed this time. I am a smoker and I also have a somewhat different sleep pattern as a result I wake up in the middle of the night and want to have a smoke. On this particular night I exited my room on the second floor and smelled a skunk. I am told marijuana smells that way. I passed the front desk and told the night clerk. Before I got the words out of my mouth he was making a phone call. I went out to my car. I had full view of the lobby. Within a few minutes a woman dressed like prostitute came running out of the facility past my car to a car and sped out of the parking lot. A few minutes later a second woman dressed like stereotypical lady of the evening came out of the lobby. A fancy car pulled up and she got in the back seat and they also sped off. I wish that is where my experience ended but not so. On a different night the desk clerk that was on duty came out of the restroom. Within a few minutes I went in the door by the restroom and smelled a skunk. This time I didn't bother to say anything as It didn't do any good the first time. My concern is not that someone is smoking it but the danger to people who happen to be around. A little hard to find but a great Hotel. The staff was great! Went to see the Cubs vs the Jays, nicely situated close to the highway and not far from Chicago. Rooms were clean and nice. Kids enjoyed the internet. I would recommend and when I'm back I will stay here. Wish this location could swap with the one on Cicero near Midway Airport. A world of difference! The only issue I had was a television that did not work but was quickly and professionally rectified by giving me another room. This was a miserable experience. There were stains all over the sheets and wall, a muffin leftover by the side of the bed, and paint on the furniture. The latch for the door was broken, as was the lid on the air conditioner controls. The TV had no brightness and, despite telling the front desk staff immediately, nothing was done to fix it. It was just so subpar. The walls are thin and they allow people to be very loud late at night. 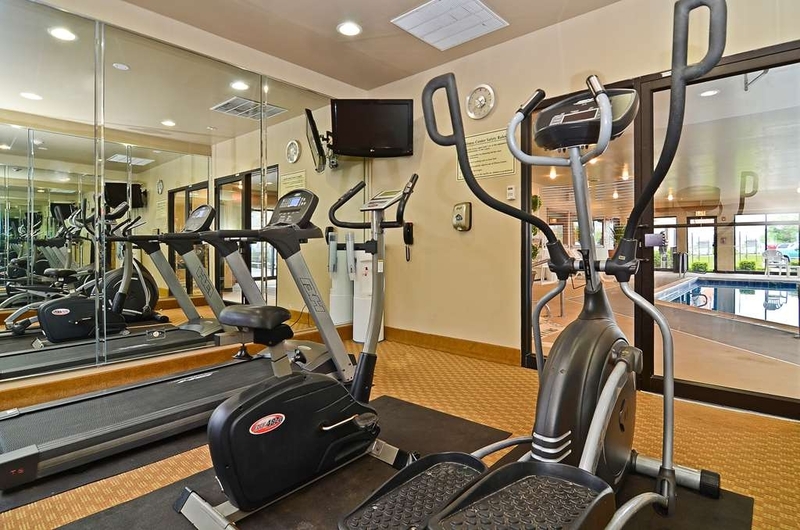 The fitness center was moved to a former hotel room and filled out old equipment. The treadmill didn't work and there were no free weights. The receptionist helped as best she could, but the sheets and blankets on one of the beds were soiled, the air conditioning was mediocre and there were kids running around half naked and unsupervised between the pool and dining room all day, and they tracked water all over the floors (which is extremely dangerous - my sister has health issues and I would have been extremely upset, to say the least, if she had slipped and fallen). This place is also pretty far off the beaten path, so considering that we paid about $140 per night, I would have to say I won't be coming back here. I enjoyed my 2 night stay at this location. The employees were exceptionally friendly & courteous. My room was clean, up to date & comfortable. My stay was very affordable & i will definitely patronize this location in the future. I also love the fact that it is like a lil hidden hideaway with not a lot of traffic. Nice hotel. Nice breakfast. 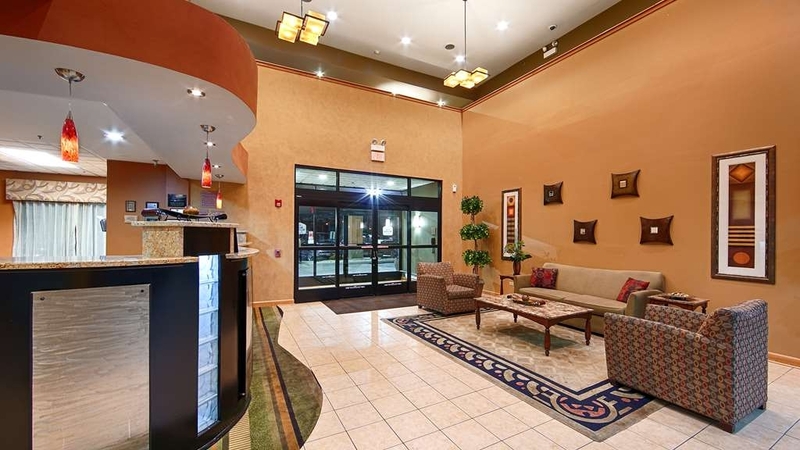 Has small lobby and nice media space upstairs. Nothing to fancy. Parking in rear has signs with at your own risk parking. Didn't like that. Also door to pool was left cracked open I guess for stuffiness maybe but that allowed for anyone to enter. Breakfast was good. I stayed two nights 7/14 ad 7/15, 2017. My room did not get cleaned on 7/15 and I did not receive clean towels. When asked about this they said, sorry, gave me a plastic bag and and said I could put the dirty towel in it and bring it to the front desk and pick up clean towel. Not until I said I would be requesting a refund for one did they send someone to bring me clean towels and pick up the dirty towels. I've traveled all over the world and never have I experienced this type of behavior from a hotel. Management needs to meet with their staff to let them know this is not acceptable! Room was very clean. Staff was very helpful. Location was great; near Walmart and several restaurants. Breakfast not so great, but it's to be expected. We were surprised at the cleanliness of room, so we tipped the cleaning staff well. I was very surprised and satisfied with the hotel. The room reminds me of the Holiday Inn. I would definitely stay here again. Even though the room phones didn't work because "a part was missing" lol. We were perfectly okay with that, we have cell phones. The beds weren't that soft, but if you just need a reasonably priced room for the night, it will do. The whirlpool, phones, coffee and orange machines were not in working order. 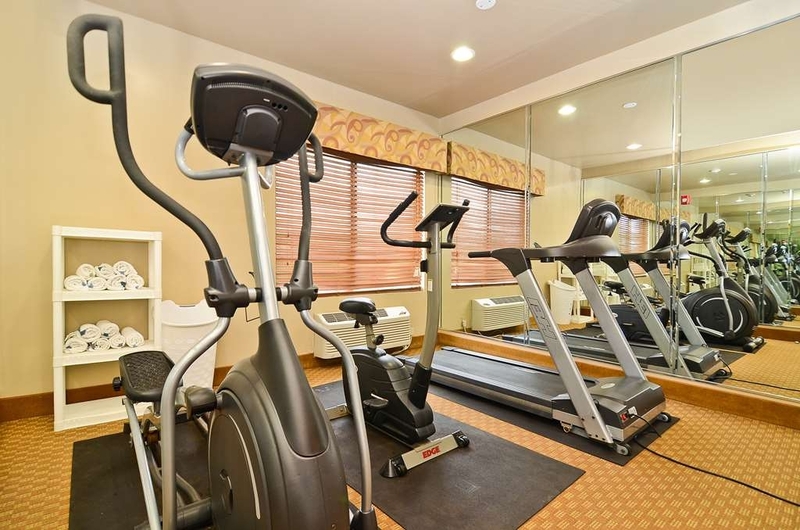 The fitness center was not as pictured online; it was a couple of old dirty equipment pieces in a hotel room. Staff was pleasant, bed was great. Overall maintenance was lacking. Water stains on guest room ceiling and dirty carpet. Terrible Birthday weekend. Hot tub didn't work by the pool. Room was not cleaned properly. Had to plug in lamps. TV had 1 channel working and 2 phones in room neither worked. Didn't know this till we got back from concert at 1am. This was a very unfriendly - and downright rude - area to stay. Many horrifying experiences at hotel and out in the community (restaurants, shopping, etc.) We were bullied by a teenager staying a few doors down from us...only reason I can figure is because we are elderly. If you do decide to stay here, book directly through the hotel! 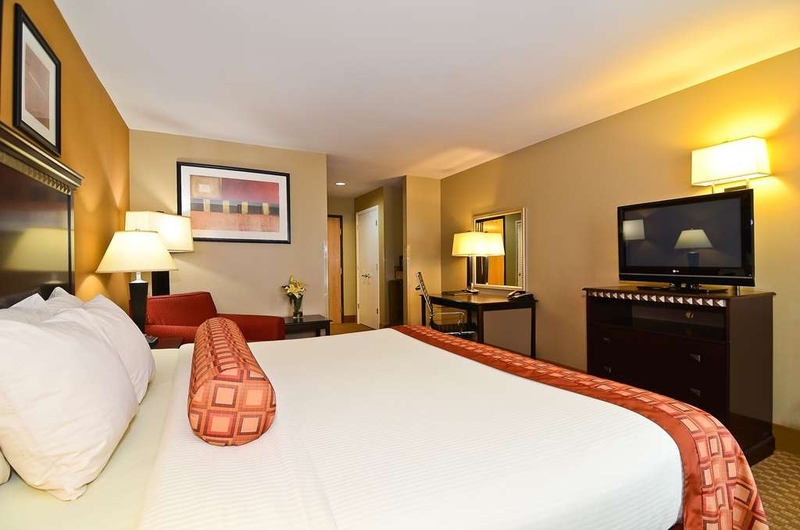 We booked through Hotels.com, and every detail of our reservation was incorrect (type of room, length of stay, etc.). Fortunately, we were there to visit museums and do things in Chicago, and those experiences were all wonderful. We just spent as little time as possible at and/or around the hotel. The pool area was disgusting, hair floating everywhere, trash everywhere, no towels. Breakfast was not well stocked and the dining area was dirty. The hotel had an odor. Our room was sufficient but not great. We were gone all day and they did not come to clean our room. The vending machine was broken. Overall not a great experience. This visit was a mess from start to finish. At check-in my room rate was wrong, and it went downhill from there. Dirty room, visibly dirty sheets on the pull out sofa, broken window in the room, not enough towels, sticky and dirty desk. It was bad. It was also too late for us to find other accommodations. Thank goodness it was only one night. this is the first negative review I've ever left on Trip Advisor. It was that bad. We stayed for two nights unfortunately as we had pre-booked before leaving Australia. Definitely not worth what we paid. The first room we were put in had a damaged window frame and cracked window and had an odour. After complaining we were moved to another room which had the window jammed open (half an inch). The hotel is dirty. The coach had stains and rips on it. The hallway had a stench. Plastic mattress liners on the bed. It questions what kind of establishment this is. The a/con didn't cool properly and was noisy. Lift was questionable. Parking limited. I wish I had seen some of these other reviews before I booked. This experience has secured no further business from us for the Best Western chain. Want to rate this as a zero but this is not an option. "Three night stay for anniversary celebration"
The hotel is nice and clean. Both HOT and cold breakfast available. I wish the juice dispenser in the lobby would have been available all day but it is only to be used during breakfast hours I believe. Otherwise, great hotel. Enjoy your stay. 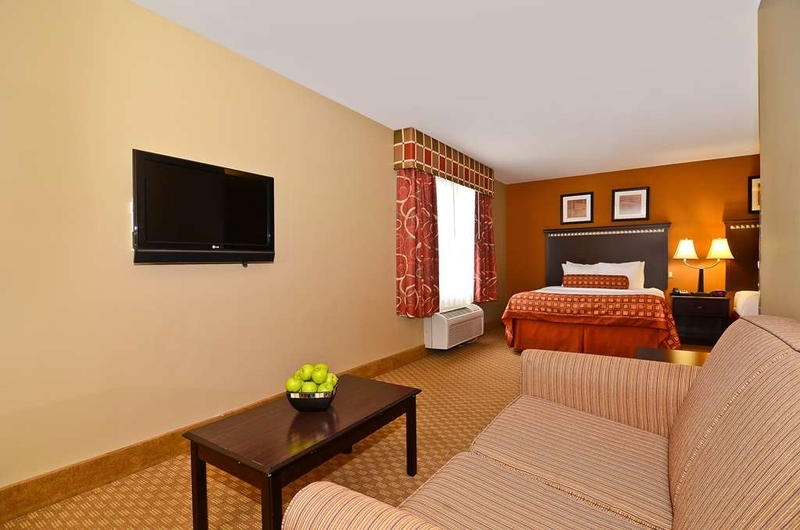 "best western in oak forest"
This hotel is very clean ,has great amenities and is very relaxing.The staff is wonderful. The breakfast was so good , almost like a home cooked meal !Also a great place for kids for some family fun. Looking forward to my next stay. "Terrible Experience with Marijuana Smoking"
I had a terrible experience this past weekend with someone feeling the need to smoke marijuana in this non-smoking hotel. My wife, son and I were in from out of town for a high school football camp and due to the illicit smoking we had to leave the hotel. We talked to Morgan at the front desk to bring this to her attention, and she did nothing to address the situation but to offer 50% off the room rate. When I explained we couldn't be around the smoke and had to leave, there were no apologies and no refund provided, nor did the security guy seem motivated to go address the issue. We desired to get a full refund and even talked to one of the owners Mr Patel, who said he would look into the situation and get back to me the next day, however I'm still waiting for the conversation and the full refund. This is not acceptable. Please think twice about whether you'd like to give your business to this hotel. I have stayed at this hotel twice now and both times I have been the staff and the hotel has been outstanding, they really do make their guest feel like home which is perfect. The hotel is in an easy place to get to and is close to many stores etc. It is truly and outstanding hotel. Great staff and service. Cleanliness was great as well!!! They accommodated my guest and I with the room that we needed after booking the wrong room through hotels.com by accident. Breakfast was great and the WIFI was strong. Thank you very relaxing...pool and whirlpool nice area clean. Internet area nice. Welcoming environment. Staff very helpful with great smile and customer service. Would highly recommend.. Even for family outing stay.. Saw couples with their children swimming laughing.. Wow. Nice. I could have stayed at a motel if I wanted to have to see a shower with cracks all through it and ants on the floor. Plus my bill was wrong and a Manger is never in office to fix the problem. Was over charged from what the lady at the front desk told me the stay was going to be, but they seem not to care at all. Been calling for a week and a Manger is always to busy to answer the phone leave information for them to call back and nothing. Check In was efficient, the clerk was nice. we were provided wristbands for the pool but I am not sure why, we were the only guest during the two day stay that I seen wearing them. Pool itself was gross! Cold clouded pool water, the hot tub was luke warm and literally had hair around the chipping paint and even a bug floating inside along with additional hair. My toddler was so upset I did not let her in, big bummer. Breakfast was just ok nothing too fancy. The suite that I was in had a broken frame on the window that had huge screws, which I later showed to the clerk at the desk. Very unsafe when there were two toddlers in the room. Also the beds in our room were made, but they must not have been changed, I noted a distinctive mark on one of the sheets that was still there after the room being "serviced". Vending machine was reasonably priced, which was nice. Overall not sure if I would stay here again, the pool was the deal breaker for me, especially when it was one of the main reasons we picked this Best Western. Very nice hotel with clean facilities. Reasonably priced items in the vending machines.The staff were helpful and courteous. The breakfast was better than most. I will stay here again when I travel this way again. It was a great experience. Very attentive staff!!! Belen was very nice at time at check in she made it so easy, since we were so tired from our flight we got in at 1 am she gaves us water and some snacks... Breakfast was always nice and warm!!! Nice enough hotel. Was only in town for a funeral and not from the area so I wasn't there much. It had a nice breakfast and only issue was the wind would blow through the window and it kept me up the first night and was to exhausted to notice the 2nd. "Not so clean but good parking"
We stayed one night here on a road trip from VT to WA. Hotel was quiet, but definitely not smoke-free: someone was smoking in the business center and the entire second floor hallway smelled of smoke. 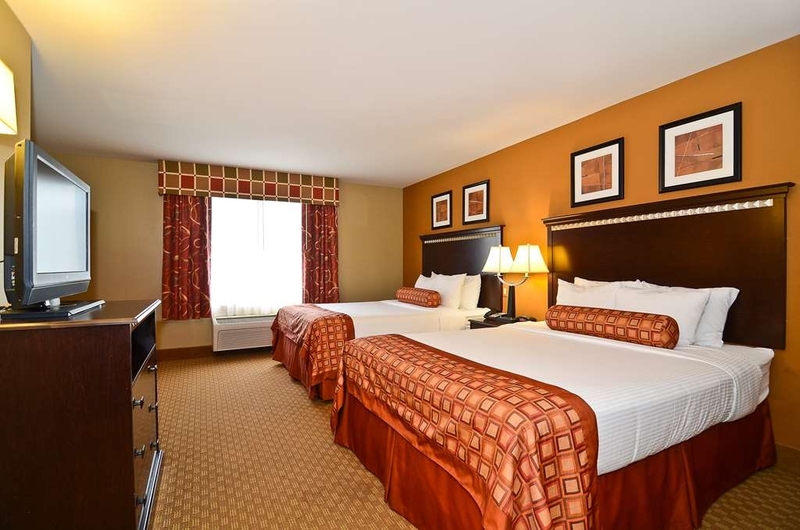 The room was clean and comfortable, and the hotel is convenient to many restaurants and the interstate. Very clean, nice staff, friendly. Location off dead end road, little uncomfortable. System would not take Discover Card was told problem would be taken care by time of checkout was not the case. Security guard on property at night time. Internet not the fastest but fine. Good price. I had no problems at all with this hotel. Although it was only a one night stay, it was a very pleasant stay. 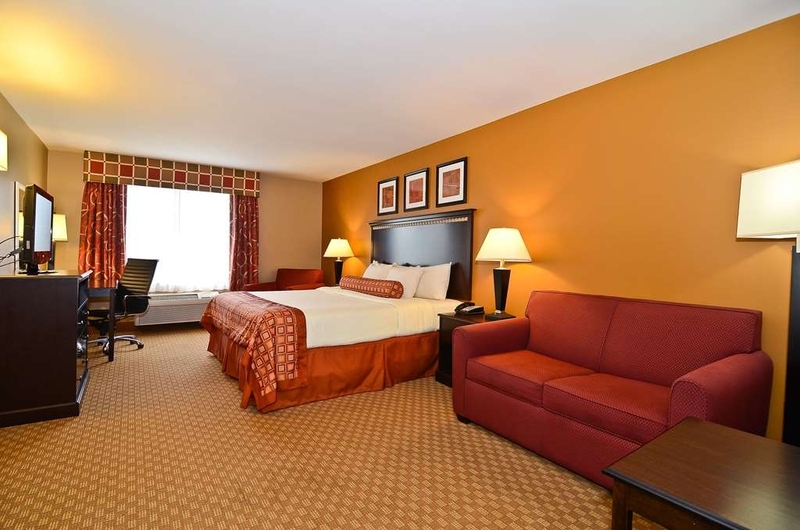 The room was clean and the staff was pleasant. 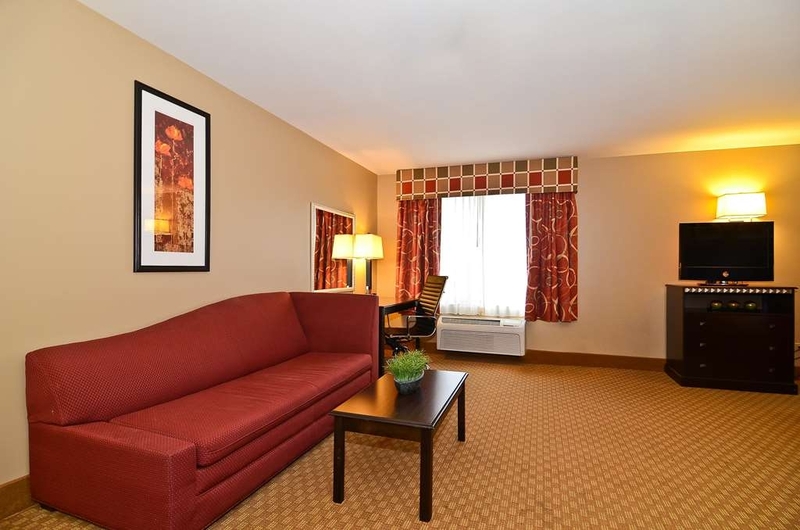 I believe I will make Best Western my hotel of choice whenever I travel. "Request a Second Floor Room"
Our first night at this hotel was a terrible experience. We only managed to get ~2 hours of sleep due to the guests above us stomping around the entire night. Although we brought it up to the front desk's attention several times throughout the night, the noise continued. We've come to the conclusion that their walls/ceilings are paper thin. Thankfully, the staff was able to move us to a room on the second floor for the rest of our stay. Problem solved! We had no further issues, and were happy to catch up on sleep the next night. The breakfast is actually really good. The food items changed periodically so you didn't have the same choices every day. Waffle maker, eggs, biscuits and gravy, sausage, eggs, and the "normal hotel breakfast food" were all available. I stayed a week & tried out 2 different room types. One was a standard king & the other a king w/couch. Both were designed well w/comfortable beds, although the pillows in the smaller king were more comfortable. Personal preference, I guess. LaToya at the front desk was great & offered assistance when I needed it a couple times. Breakfast was really good w/a variety of hot & cold options, plus fruit. The pool & hot tub were also a real plus & maintained very well. I will stay here again! We felt very safe. The hotel was a bit difficult to find because it was on a frontal road. We needed to rely on our GPS. But the location was near nothing that would cause us to worry about the somewhat dangerous area. If you want a place within walking distance of restaurants, or beautiful surroundings, this is not the place. But if you are looking for a very good hotel reasonably priced, it was very good. Transportation by car to the city was nearby. 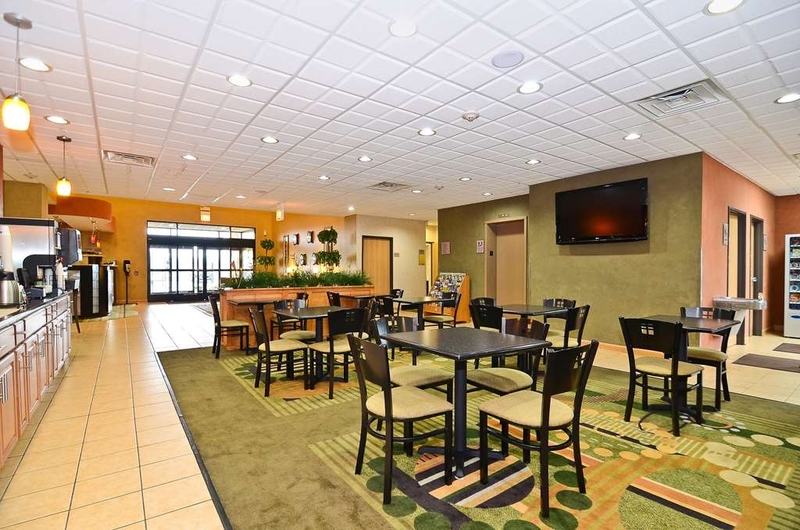 The amenities were very good for families and business travelers. I'd heard this area of Chicago was bad. I never got that impression staying here. It is well lit, feels safe and clean. It was conveniently located next to the interstate and everywhere in the suburbs I needed to be. Breakfast was pretty ok too. The room was clean, roomy, and very comfortable. The check-in staff was more than courteous and very helpful with everything. The breakfast was more than I expected. Breakfast consisted of scrambled eggs, biscuits and gravy and sausage along with muffins and bread for toasting and waffles. I'll come back. 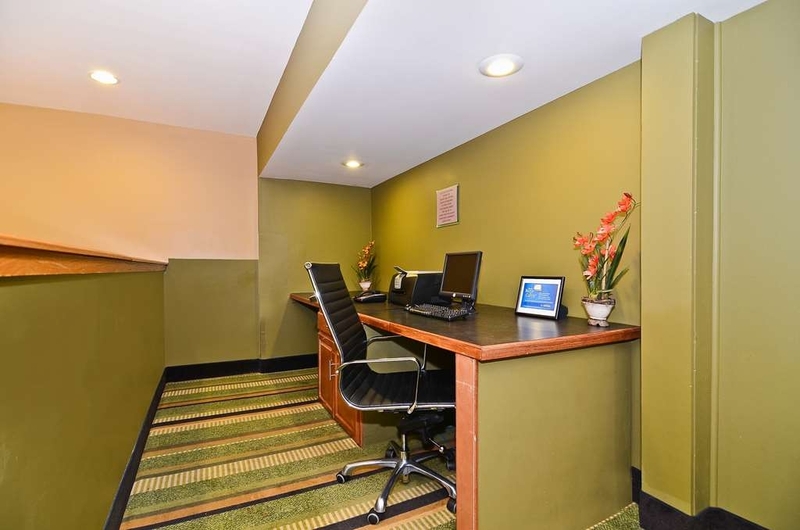 "nice stay would stay again"
very comfortable and convenient not far from express way. clean and food was not bad. kids enjoyed indoor pool and over all stay was very good . Never really had a bad experience with Best Western. location a little secluded and not a lot of traffic by the hotel. 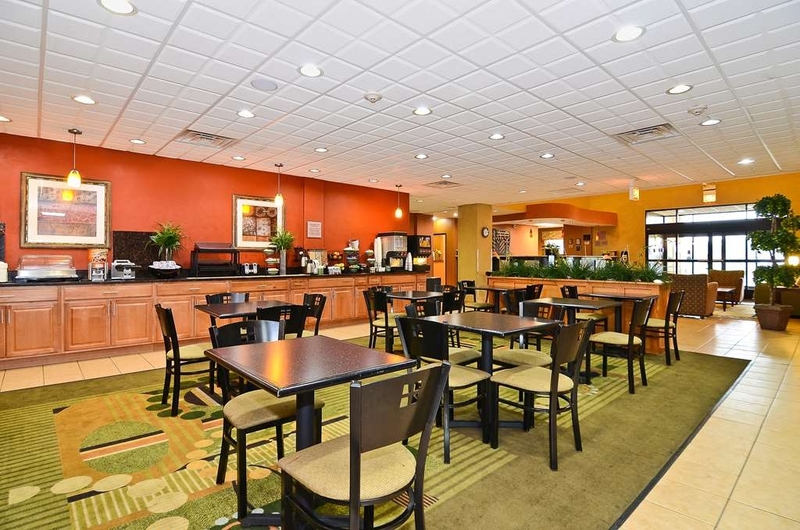 Hotel was comfortable, clean and accommodating, with great staff and good breakfast. Stayed 6 days and was happy with our stay. Liked location near shopping center and restaurants. It was in an industrial area and near the freeway, making it convenient for us to visit relatives. Be careful at this location. I have been biting by beg bugs, they were aware of the problem. Only offered to refund me the one night stay. What about all the itching and scars left behind and worse what if my house gets contaminated. "Good hotel in a not so good area"
The staff were top notch. The bed was not so comfortable but the rooms were clean, the bathroom was large compared to some places I have stayed. The internet was so slow I thought I was on dial up service. The surrounding area was not so good. This is a fine location for the south side of Chicago. The south side can be dicey but this is a decent property. Clean and moderately priced for Chicago.. The front desk was un familiar with restaurants near by except for fast food. We discovered many restaurants not all that far after wandering for a while. Stayed here after s concert at the Hollywood casino amphitheatre. Very wonderful experience. usually hotel prices are very high during summer. If you don't want to spend huge amount and plan to visit Chicago, consider this hotel. It took us 35-40 min to reach Chicago. We had one extra person. When we asked they arranged extra bed for us and it was free of cost. This was first visit of parents to US and they have thoroughly enjoyed hotel ambiance as well as quality of breakfast. The TV in the room didn't work and the breakfast buffet didn't include a meat. Other than that the stay was relaxing and comfortable. 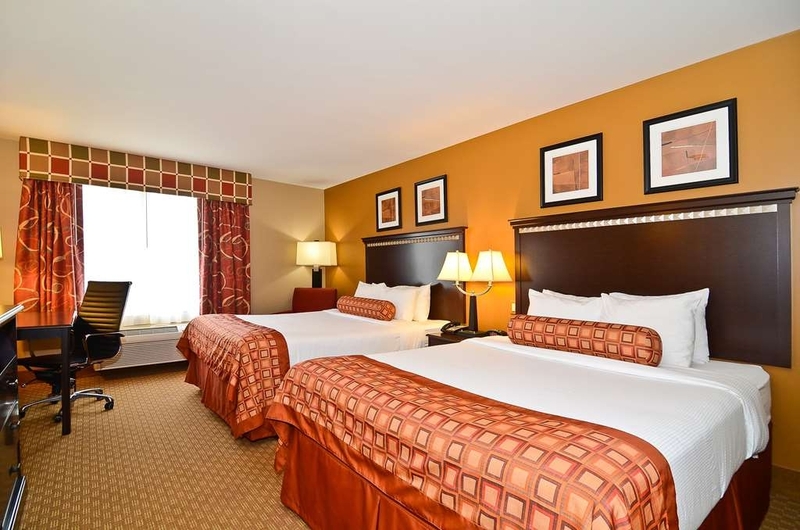 The room and common areas were very clean and the hotel staff was very helpful. My friend and I needed somewhere to crash for the night unexpectedly. 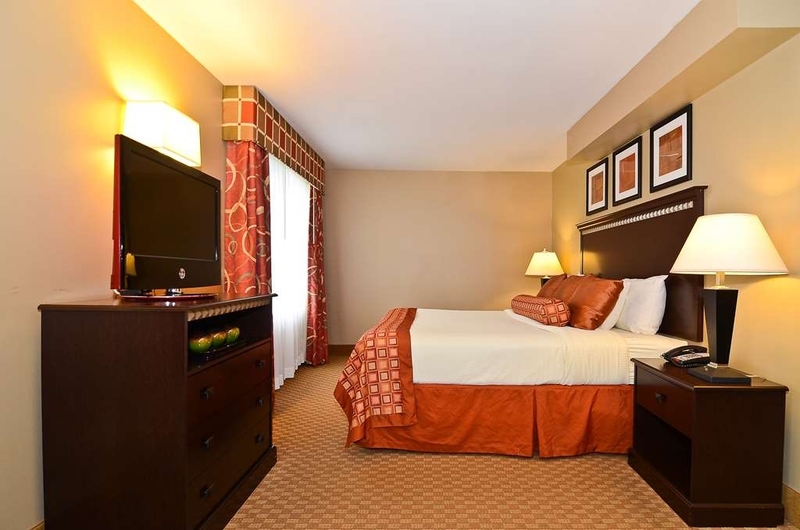 The room and bathroom were clean, the beds were soft, and the staff was very friendly. The continental breakfast wasn't anything special but it did the job. I will definitely be returning! Pool area was really nice and we had a quiet nights sleep. No problems with the internet connection and plenty of hot water and water pressure for shower time. Breakfast selections were good and we left satisfied. I recently had business in Chicago and stayed at this hotel because of how expensive it is to stay in the city. It was a little secluded off the highway, which honestly I sort of appreciated. It was still easy to get to, so I could jump on the highway and head into town for work, but it was still very safe and clean and comfortable, so a nice escape after a busy city-filled day. Very pleasant staff too, and you don't realize how important that is until you notice someone actually being nice. "Okay accommodations, but nothing special"
As soon as we entered our room, we smelled something similar to cigarette smoke. It was coming from the air conditioning unit. We asked to change rooms but there were none available. After awhile, you couldn't smell it anymore (if staying in the room) but it wasn't a pleasant beginning to our stay. 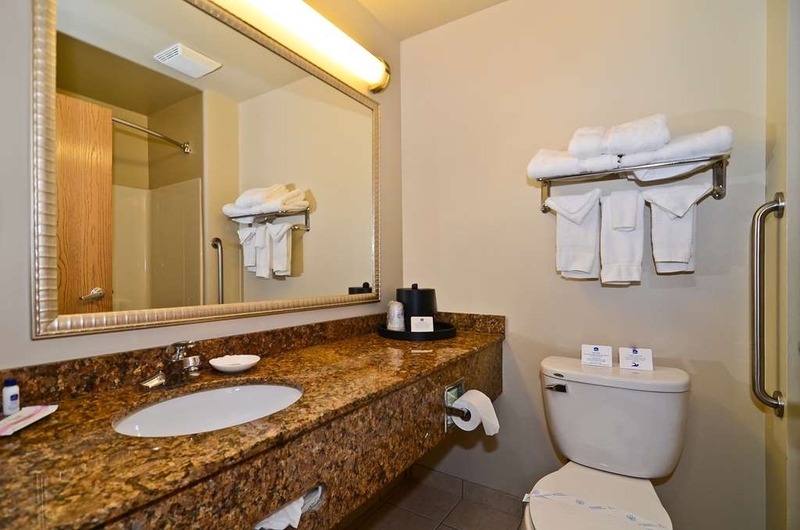 Room decor/paint was a nice neutral, but the room and bathroom were average best western fare and size. Lobby area and breakfast was the same. Nothing special but if you are short options, this hotel could work. View from hotel and immediate area was unimpressive, felt like I was driving through an industrial park. The hotel staff and room was awesome! We booked through Orbitz and Orbitz had issues with funding our money that we paid them to the hotel. The staff here as so nice and patient and worked it all out for us. If we are every in this area we will stay here again. This one one of the better Best Western's I have stayed at in the past year. I thoroughly enjoyed this stay. The breakfast had plenty to offer, and well stocked. The attendant was very friendly. The comfort of the beds was really good, newer pillows would be a good idea . I am a diamond member of Best Western. I understand they are independtly owned and operated. I will never stay in one again. First, there were ants. Ok, it happens. They gave me another room. I brought a pillow with me. I forgot it, so I called on my way home. They said no problem, they would send it to the house. I expected ups, maybe. I should have asked. The pillow came by fed ex 2 days later. It is a small pillow that weighs less than pound. Today I received a call from a collection agency for over $100. I never received a bill, nor would I ever have agreed to paying that. I paid it as it was already at a collection agency. I will never give Best Western (or fed ex) my business again. This hotel was great everything from the staff to the rooms we're amazing. I really enjoyed the breakfast, the pool and the workout area. I would recommend this place to friends who are coming to Chicago, it's a great price and very close to the downtown area. "Wonderful, Friendly and Perfect for our visit!" My children, although being 21 and 18 were headed to Chicago for a Neal Degrasse Tyson event at the Chicago Theater. This hotel was a perfect choice!!! Wonderful location, very up to date and very clean rooms, wonderful internet for all the research before the seminar....we couldn't had asked for better. The staff was amazing and very friendly. Even though my children are pretty much grown, it was very nice to have such a wonderful, clean and safe alternative to downtown Chicago! Thanks again everyone for your wonderful hospitality!!! Odd location for the Hotel but comfortable and a great breakfast. Hotel is located just off a freeway in an industrial area. Inside hotel is updated and clean. Nice pool and hot-tub. However the fitness room is small (treadmill, bike and stepper). I was pleasantly surprised at this hotel. It was clean and provided a full breakfast each morning. I recommended it to a family member needed a place for his son and grandchildren to stay when they visited. I pointed out that not having to provide breakfast for four kids would be worth the cost. This location also has a pool so the kids could play in the water if they liked. The only problem I had was that the walls tended to be a bit then. I woke up one night to a lot of bumping against the wall one side. One can only imagine what was going on in that room. Then another night, the room on the other side had its TV sound up too high. It kept me from getting a good nights sleep. Otherwise, it was a good place to stay. Near-new facility, well-located, excellent and courteous staff, spacious, clean and well-appointed room, comfortable bed, adequate breakfast, Surprised but pleased to receive courtesy call from front desk confirming that everything was satisfactory. This hotel is conveniently located off the interstate. It's less expensive and much quieter than staying in the city and it's only a half hour from whatever you wanna do! There's lots of useful stores and casual food options nearby. Our room was quiet, clean and comfortable. I will stay again! 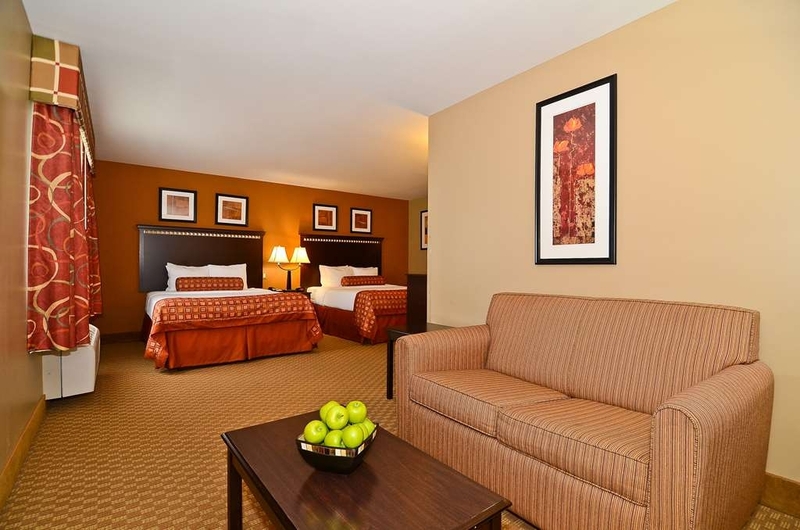 Just off the highway, clean and comfortable rooms, modern decor and good breakfast. 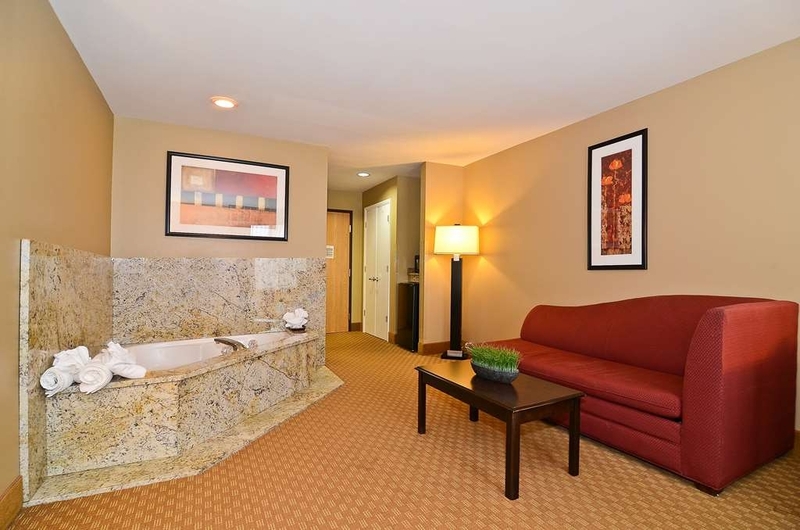 Has heated pool, hot tub, exercise room, plus fridge, microwave, and coffee maker in the room. Staff is friendly and helpful. The shower is great, hot water and water pressure. Safe neighborhood, about 30-40 min from downtown. 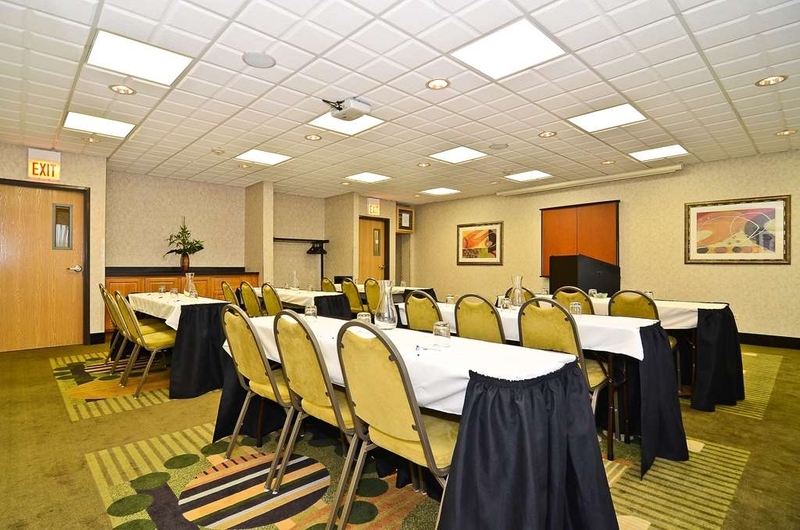 I worked with Stacey the manager at this hotel to bring in 35 people, 22 rooms and used the meeting room for 2 days. 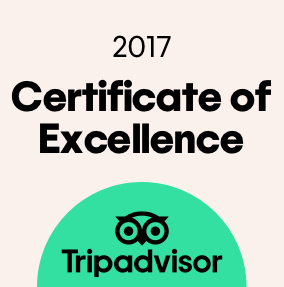 Our experience was excellent. The hotel is a little out of the way for restaurants, but good freeway access. The entire staff was amazing! We used this hotel as a stop-over on a trip further south.It wasn't far off our route and there were several choices for meals relatively closeby. The breakfast was a little disappointing but other than that everything was fine. We have traveled to Tinley Park twice a year for the last 7 or 8 years. I decided to mix it up and try this hotel out. It was a great find! It's nice, definitely nicer than almost all of the hotels in Tinley Park and it's not very far at all! Super easy to get two and from the convention center in Tinley. And we all loved the mattress! It feels like a spring mattress with an air mattress on top. I also think these were the cleanest pillows/blankets I've slept in! The pillows were in two pillow cases and you could tell the pillows get washed as well. It is a little weird to get to this hotel, it's literally smack dab in the middle of an industrial park. It's really secluded and gives a bad first impression, but the inside is nice. The walls are way too thin though. "Great Staff- friendly, wonderful location"
Upon arrival I was greeted by a very friendly staff. This is my 3rd time staying at this location and I love how close it is to downtown Chicago. Close enough to get their in good amount of time (20 minutes) but far enough away to not have to worry about what is outside your hotel room. Rooms are very clean and there moderate breakfast. I will stay here again!! 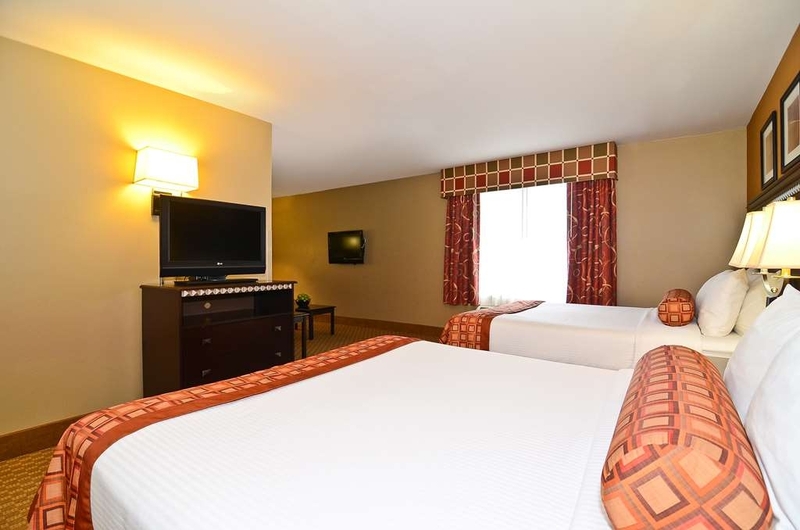 "Nice, clean, and quiet with heated pool"
Conveniently located in the quiet suburbs of Chicago, right off the highway, this hotel is about 30 minutes at night from Chicago or 45 minutes with traffic. And there are no tolls along the way. 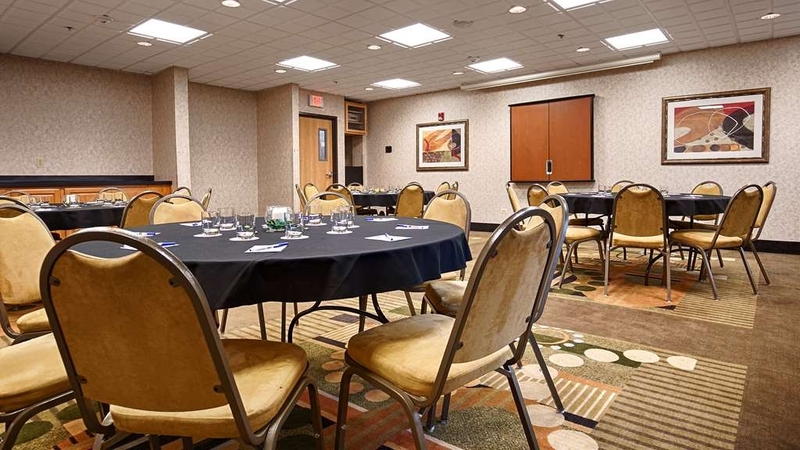 It has a very nice heated pool and hot tub, exercise room, business center, and free breakfast. The staff is friendly. The rooms are clean, comfortable and have good water pressure. Thank you for being our guest and taking the time to leave us a review! 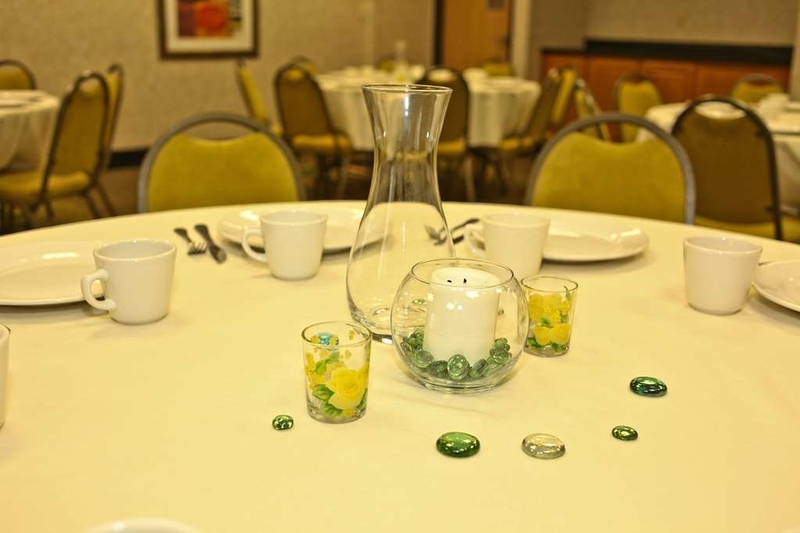 We are so happy to hear you enjoyed our convenient location and had a chance to use many of our amenities. We look forward to serving you again soon! The nature of the customer service issue I sustained while staying at this Best Western location was at first wonderful. The nature of this incident derived from the last visit as I was double charged for the Jan 6 to Jan 11th visit. Since that time, I was treated as if the staff had more respect than the customer. After sending my concerns to the General and Regional managers of AATISH Management, LLC of my situation, they both treated me as if I was a liar and as a hostile consumer. Was told that I left out on a day that I did not leave and my room was purchased on the same day I stayed. I asked for date-stamped time videos and recorded entry key records of which I did not receive from the hotel establishment. I supplied bank documents and advised the Best Western 800 service to investigate the point values and actual hotel visits of this location to receive an unpleasant response from management and staff. Mark who serves as the late night desk clerk was the only person who told the truth concerning management personnel and the return of the General Manager Stacy Pote's return from vacation. Staff (Kathi and General Manager Stacy Pote) had personal conversations with management about our visit and admitted (Kathi) this upon our arrival. Staff (Kathi) also admitted to the mistakes that occurred on the dates Jan 6-11 by stating a computer inaccuracy occurred. I am dissatisfied at the first impressionable outlook of my first visit and comparing this to the compensated second visit as a infringement of my character as a consumer by the mistreatment of the overall regional (Tami Robertson) and general management and staff. Staff consisting of Kathi, Stacy (General Manager) and Sandra (staff posing as an Assistant Manager when there is no existing support management team for this location according to Mark the night desk clerk. As a educator, I am appalled at the conduct the owner AATISH Management, LLC has placed in charge of customer care and consumer services. I will advised my co-workers to choose elsewhere when considering a hotel reservation and location. 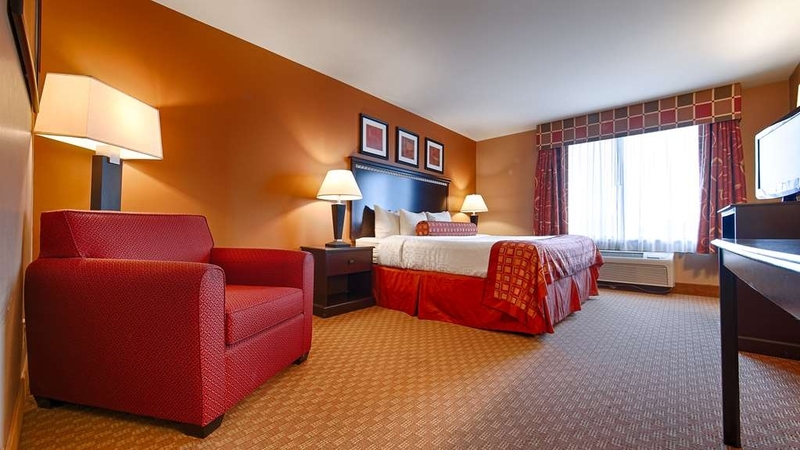 You can count on this, it will not be the Best Western Chicago Southland in Oak Forest, Illinois! "Good price and convenient location"
We stay at this hotel because it's clean, neat, and close to University of Chicago and Chicago. It's priced well in comparison to hotels in Chicago. It's more of an industrial area right off the interstate and the neighborhood seems okay. Thank you for taking the time to leave us a review! We are so happy to hear you enjoyed your stay with us and find our location convenient to the University of Chicago and Downtown Chicago. We look forward to serving you again soon! This hotel was excellent as usual. The manager on duty handled the problem as quickly as possible. This was a prime location for me and there were a lot of restaurants and a movie theater available in the area. WOW what a great review! We are happy to have you as a regular guest and glad we were able to handle the problem you encountered quickly. We look forward to serving you again soon! Service is fantastic but no Wi-Fi/internet srvice is awful. The employees were respectful and cordial. 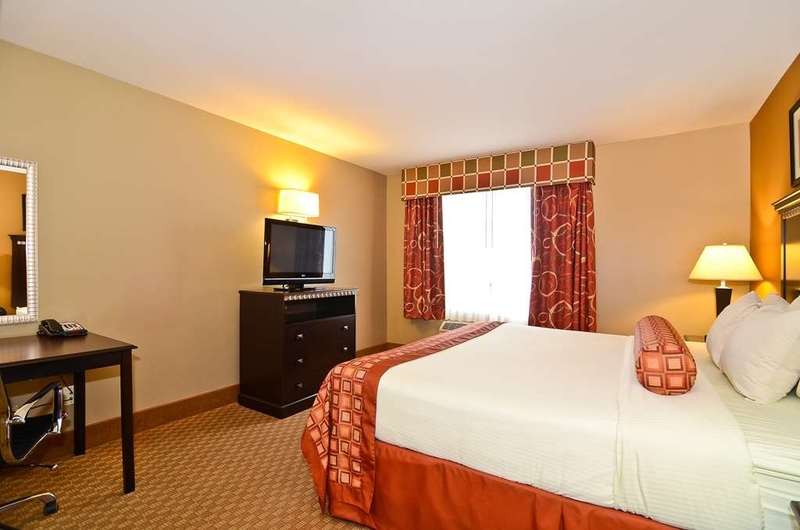 The room is just what the doctor ordered in terms of cleanliness, set up and amenities. I could not connect to the internet for it was not available as published in the company's web page and this was very disappointing. Thank you for taking the time to leave us a review! I would like to apologize that there were issues with the Wi-Fi during your stay. We will have our IT team make sure everything is working correctly for future guests! We hope you stay with us again and we will make sure our internet Wi-Fi is up to par with our service and other amenities. 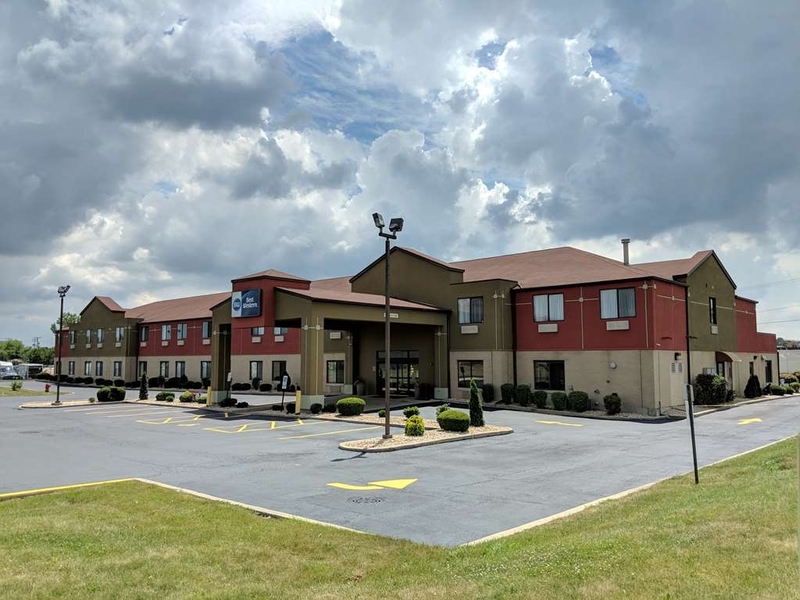 "Great Staff, Kathi, Stacey, Sandra and LaToya"
As a first time visitor to a Best Western Hotel, the staff members mentioned were extremely helpful and made my birthday vacation a beautiful experience. The accommodations from housekeeping to breakfast and complimentary cookies from the front staff were sublime. Please make this a enjoyable time for yourself when searching for a hotel. The Chicago Southland Best Western is the place to be and I highly recommend this location. WOW what a great review! We are all thrilled to hear we were able to make your birthday vacation a beautiful experience and you enjoyed your stay with us! We look forward to serving you again soon! Thank you for taking the time to leave us a review! We are so happy to hear you enjoyed your stay with us. We strive to make sure all our guests are satisfied with their stay and will us your suggestions to make future improvements. We look forward to serving you again soon. 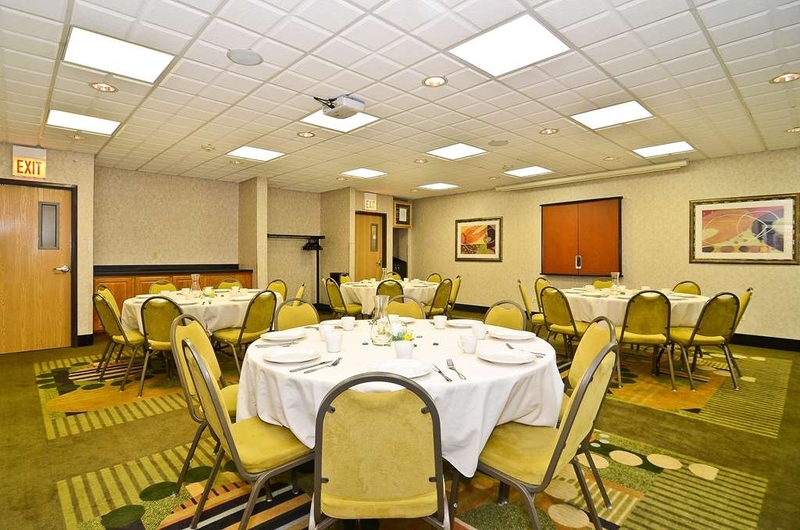 This hotel was located in a prime location near many restaurants and other shopping. I will most definitely stay here the next time I visit the Chicago area. I loved the décor and how clean the Bathroom was. Ann the representative, upon checking in was very patient and courteous with me even though I were a little grumpy. I appreciated her. Thank you for taking the time to leave us a review! 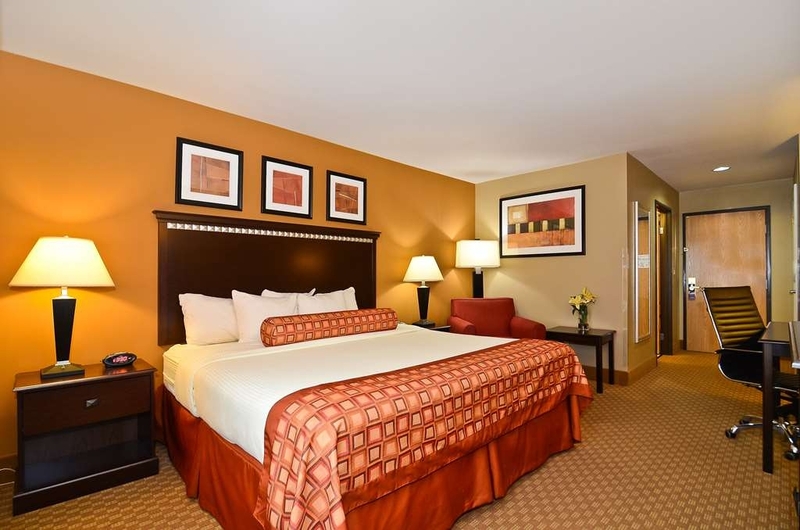 We are happy to hear you enjoyed your stay with us and found us to be located in a prime spot near many restaurants and shopping. I will be sharing your comments with Ann to make sure she knows you appreciated her patience at check in. We look forward to serving you again soon! I enjoyed my stay. The hotel well maintained and good staff. I only have 2 things that needs to improve (1). The mini sofa mattress needs to be upgraded. (2). Due to the location of this hotel it would be great to have more parking along the front entrance. Thank you for being our guest and taking the time to leave us a review! We are happy to hear you enjoyed your stay. We will use your feedback to make future improvements. WOW what a great review! We are happy to hear you enjoyed your stay with us and staff members were polite and kind. We look forward to serving you again soon! The hotel front desk person was very nice and accommodated my requests for a quiet room. The room was clean but fairly run down. The bathroom shower had patchy discolored areas and a curtain that didn't have a waterproof liner. The beds were fairly uncomfortable and I was miserable the first night with the lumpy pillows. Luckily, I found that some of the pillows were not the lumpy, partially filled down ones, and a more supportive hypoallergenic type. The sheets were pretty scratchy, low thread count. The mattress edges were raised higher than the actual mattress, do that wasn't very comfortable. The other bed had done debris (plaster chunks from ceiling?) The temperature control was easy to use and worked well. I only had breakfast once -it was ok. Do it yourself pancakes, cereal, famished, and yogurt. Walls were very thin- the second night I woke up to people living into the room next door and could hear them until 3am. I think the hotel was overpriced for being a 2.5 star class (which was unfortunately the highest rating for the area). The weekend prior I stayed in a 5 star for only 10 more a night with all the luxuries and amenities. I never saw hotel staff excerpt for check in/check out, but both of those went smoothly and quickly. I would probably not stay here again because I am a light sleeper and could hear everything around me. We stayed for 2 nights at this property. The service was great at check in and check out. We did not have any issues arise in which we needed assistance. We stayed in a suite and the room reeked of what we believed was cigarette smoke. The property is non-smoking but there is a lingering odor. The breakfast on the first morning was great! The next morning was not so great. It seems that they rotate out the options so it's hit or miss what you will get. The beds were decent but the pillows were awful and lumpy so bring your own! Other than that, we had a great stay but will look at other properties for future stays. The hotel is starting to show some wear and tear (we have stayed here previously). First let me take the time to thank you for being our guest! We are happy to hear you had a smooth check in and check out. We would like to apologize that your room smelled of smoke. We are a completely non-smoking hotel however sometimes guests disobey our rules and are willing to pay the smoking fine of $250. I also will be reviewing your comments about our breakfast. We have been offering a rotating menu due to many guests staying multiple nights and wanting different options and a variety. We will use your comments to make improvements. We hope you give us another chance to serve you and I can guarantee you a better experience. I was very happy to return to this location for work. My main regret is that I was only in the area for one night, as usual. However, I did discover that interstate travel from the near south side of Chicago was not bad at the end of my work day, and my other go-to option when working in the area involves a little more traffic and not as professional service or as nice of amenities/breakfast. So, this location became my first choice to consider when working in the general southern half of Chicago. The staff is always friendly, professional, and is a large part of what keeps me coming back! Thank you for allowing us the chance to serve you again during your recent visit to the Chicago Suburbs. We are happy to hear you always receive a warm welcome from our professional staff. We look forward to seeing you again soon. "Questionable value and some problems"
1st night bed was extremely squeeky just moving side to side. Mattress definitely needs replacing. Window also let air in making noise as wind whistled through. Bad sleep 1st night after long drive and before major sports tournament. Had to move to another room and was fine. On check in hotel smelled of pot odor. Sat night one room partied till 3.45am before management took action and knocked on door. Stayed here previously and partying was a problem then too. Not again . I am sorry to hear about your experience at our hotel! We strive to satisfy all of our guests! We will be having out maintenance staff go through and check the quality of all of our mattresses. We also would like to apologize that guests were disobeying our non-smoking policy. We do strictly enforce this and once we know what room the smoke is coming from the guest is asked to leave and charged a cleaning fee. We hope you give us another chance and I can guarantee you a better experience. The property is clean and inviting. Its very safe and secure. No issues with noise or broken electronics in the room. Everything worked great and the bathroom was spotless. Great location as well. 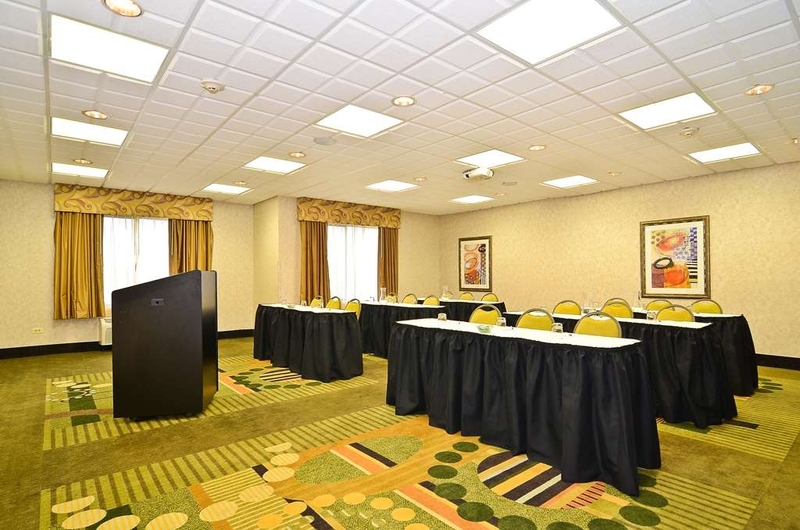 Within an earshot of downtown Chicago and many restaurants and retail outlets. Stacy and her staff were very professional and friendly. "Good hotel but bad breakfast"
Hotel, other than being on a lonely road was good and clean. Good bed and showers. But, horrible breakfast items. If your not a breakfast person, no big deal. If you like eggs and some form of meat, stay somewhere else. Thank you for taking the time to leave us a review! We are happy to hear you enjoyed our comfortable hotel. We would like to apologize you did not enjoy our breakfast. We do offer a menu with rotating hot items as many of our guests stay multiple nights and are always looking for a variety. We will look into making improvements to better serve our guests. We hope you give us another chance. I stayed here for a few nights while I was working in Chicago. The hotel was clean and the staff was extremely friendly. They changed up the breakfast each day and which was nice. The pool and work out facility were well maintained. The trip into Chicago took about 35 min with out any traffic. Next time I'm in town I'll be staying here again. Thank you for being our guest and taking the time to leave us a review! We are happy to hear you enjoyed our clean and convenient hotel and thought we were a great choice during your business travels. 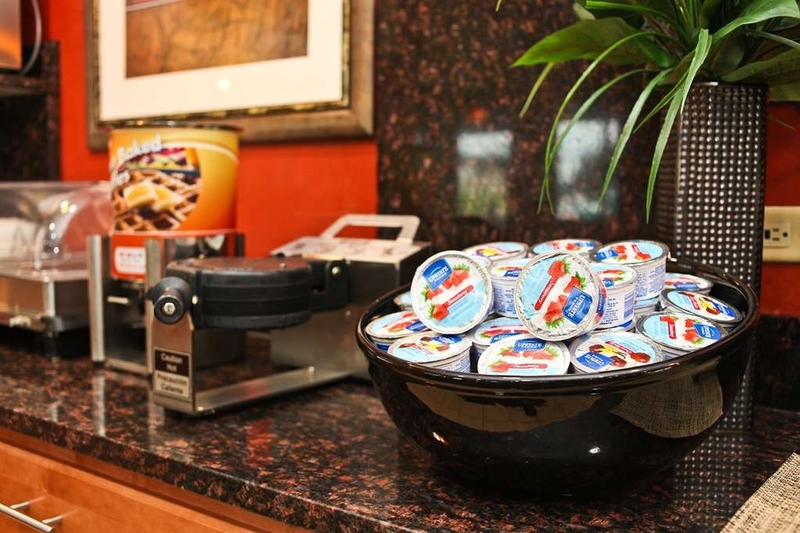 We are happy to hear you enjoyed the variety we offered at breakfast and our pool. We look forward to serving you again soon! We had a great experience here! There was a continental breakfast buffet every morning (with the bonus option of making your own waffles/pancakes ... With chocolate chips! :)). 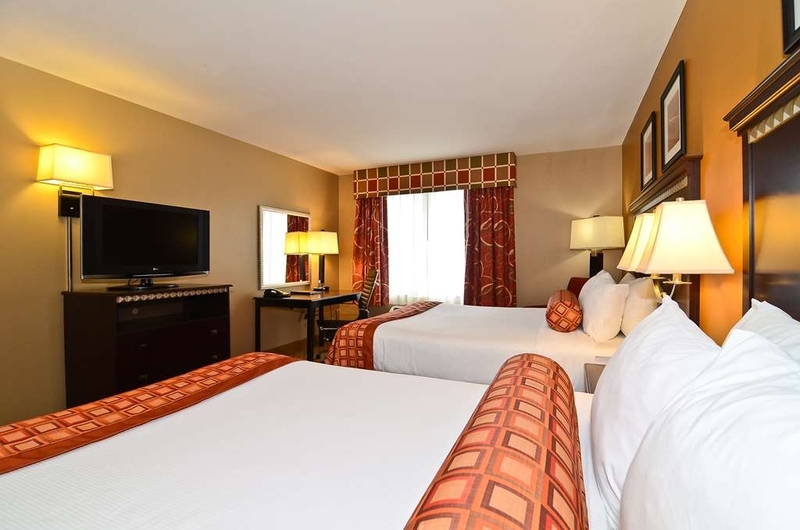 The rooms were clean and the service was pleasant. We spent a lot of time hanging out in the pool room. There was an amazing hot tub in the area and the room was open until 10pm. Towels were also provided. Although the location was farther from Chicago than we had expected, the area was very safe. There were also a ton of great dive bars nearby. We were easily able to access the train to downtown Chicago. The ride was ~45 minutes but went by very quickly. 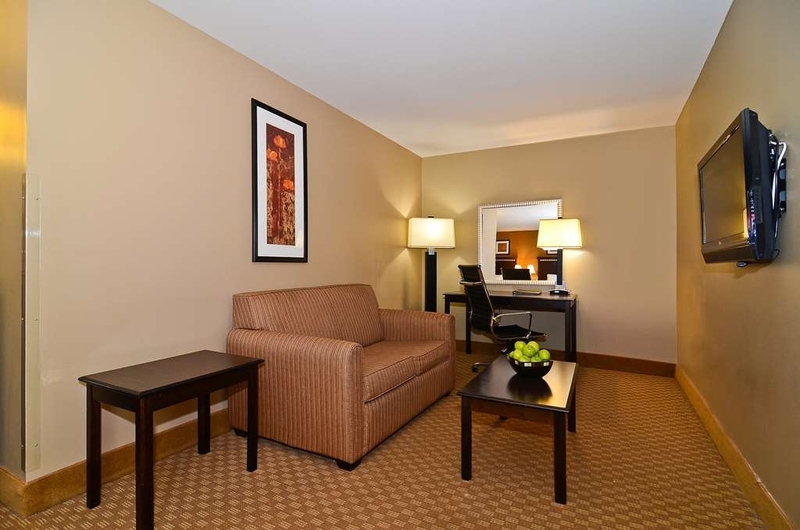 Overall, we would recommend this hotel for families or travelers passing through Chicago! Thank you for being our guest! We are so happy to hear you had a great experience at our hotel! We are glad you enjoyed our hot breakfast each morning and Yes we all love chocolate chip waffles. We look forward to serving you again soon! Welcomed by the extremely friendly customer service as soon as I entered, mind you this was almost 4 AM so I wasn't expecting the level of polite treatment I received. The building was in a great area, with plenty of food and dining options in the immediate vicinity. The bed was massive and comfortable, the temperature control in the room was wonderful and the complimentary breakfast was delicious. Thank you for being our guest and taking the time to leave us a review! We appreciate your feedback. We look forward to serving you again soon! Looking for a nice one night stay, in the south area and this met our needs. The place is off on a side road. Check in was great, friendly staff. Breakfast was good. Fresh hot and nice selection. Only challenge I had was the computer, I could not book my next room at a Best Western. Seem to be something wrong with IE browser. Other than that a great stay. Thank you for being our guest! We appreciate you taking the time to leave us a review! 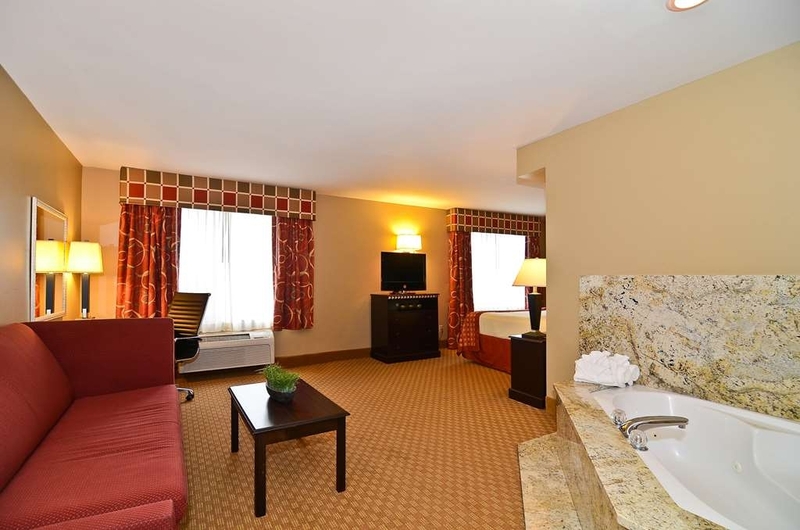 We are happy to hear you enjoyed your stay and our hotel met your needs. We will have our IT tech make sure our IE browser and internet is all working properly. We look forward to serving you again soon! This is a very good hotel to relax and unwind. The staff was very nice. This hotel is better an another one that I stayed at this past year. I would definitely come back here on a regular basis. Plus it was not too far from home. Thank you for your kind review. We are happy to hear you enjoyed a nice relaxing, unwinding stay at our hotel. We look forward to serving you again very soon. "Nice Clean Updated Hotel "
This hotel is clean and seemed recently updated. The pool area and lobby are also nice. I would have rated higher but the rooms are a bit noisy from the road noise from being close to the highway and the thin walls hearing the people in the next room as well as the hall late into the night. Also not near to restaurants. If in the area again I may consider staying here again to give it another try. Thank you for your kind review! We would like to apologize that you experienced some noise issues during your stay. We will work on making sure our hotel stays quiet after our quiet hours begin. We are happy to hear you enjoyed the pool and lobby. We hope to serve you again soon. This hotel has clean, comfortable beds and rooms. The fridge, microwave, and wifi are very convenient. I love the breakfast too. The business center is handy to use. You can't go wrong with this place. It's safe and secure. The parking lot is well lit. The area isn't dangerous at all. Thank you for being our guest! 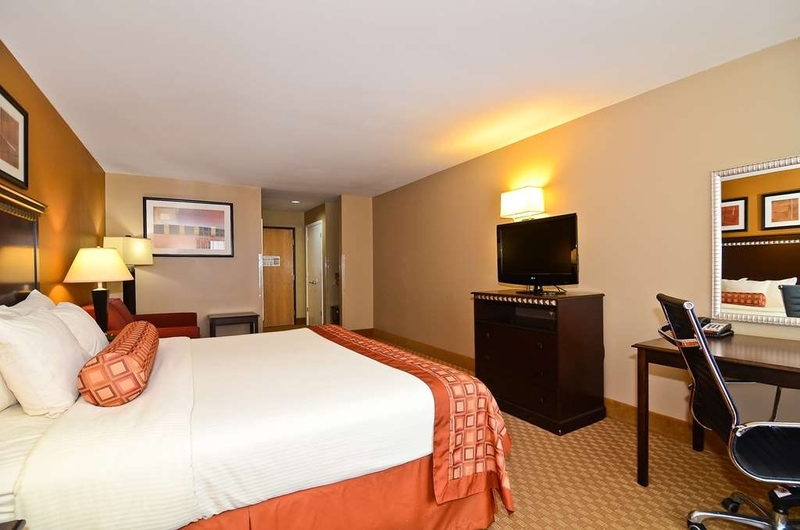 We are happy to hear you enjoyed our clean, comfortable hotel and had the chance to use many of our amenities while here. We look forward to serving you again soon. Thank you for being our guest and taking the time to leave us a review! We are so happy to see that we have came back to stay with us again! We are happy to hear you find our hotel convenient to visiting Downtown Chicago and look forward to serving you again in the future. This place was great. Nice big rooms, comfortable beds, good breakfast. Everything was clean and the staff was friendly and helpful. Conveniently located by the freeway, and pretty close a Walmart and other grocery stores. Rooms were very quiet, and I slept great. I will definitely stay here again when I come back through Chicago. Very nice, new hotel in nice location. Our check in was very fast and Stacey at the front desk was helpful and friendly. The room is large, nice, modern and very clean. The beds were unbelievably comfortable, I slept like a stone. I'm so glad we stayed here, and we will def stay again. Hopefully we have time to use the pool next time. Thank you for the great review! We are so happy to hear you enjoyed your stay with us! We hope you come and stay with us again and give yourself enough time to enjoy the pool. i give this hotel 5 stars for anyone that is looking for a quite romantic stay. The service wa awesome as well as the staff. it was a great experience. There is shopping nearby and food a great area to choose. WOW what a great review! We are so happy to hear you had a comfortable, romantic stay with us! We are pleased to hear the service and staff were awesome. We look forward to serving you again soon! The place was good. It was a fair trade in price. 8 out of 10 for everything. I would stay again when I need to save money but want to stay in a clean place. Sometimes you have to compromise on price and quality but here, both of those things meet one another half way. We just stayed the weekend at this Best Western. The hotel is in an industrial park, but there are signs that guide you there. The hotel is clean. The young lady who checked us in (Friday around 2:30pm) was very sweet and helpful. Our room was great. The breakfast was fine. Two hot entree's, but they were different each day, which is great. The lady who worked the breakfast area on Sunday morning, was very friendly, always had a smile on her face. She kept filling everything, never stopped for a moment. The business center was clean and the computers were decent to work on. Though I would advise the overnight clerk, to be careful what personal conversation he is having, due to the fact I heard it. I was in the business center very early on Saturday morning. All conversations can be heard. The vending machines in this hotel are very reasonable. WOW what a great review! We are so happy to hear you enjoyed your stay with us. 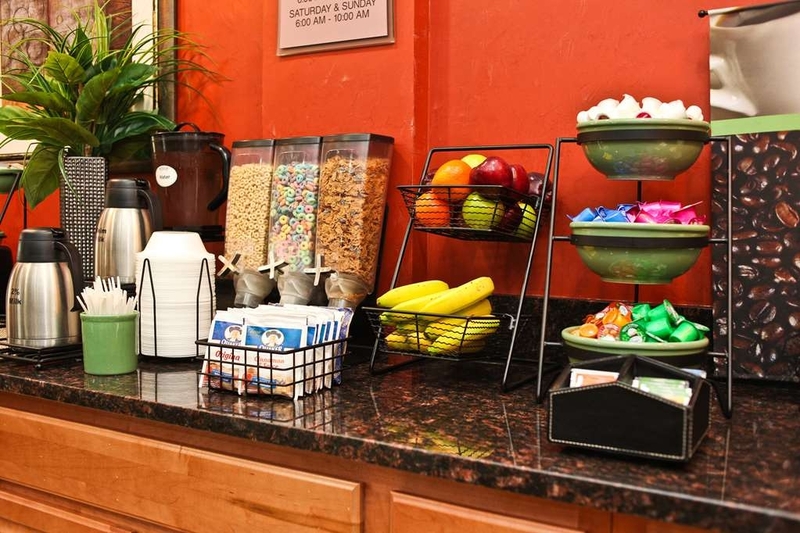 We strive to provide our guests will an excellent breakfast to make sure they have a good start to their day. We try to offer a good variety because many of our guests stay more then one night. We are also happy to hear all staff members were friendly and helpful. We hope you stay with us again in the future. We arrived on Saturday afternoon and stayed until Monday morning. Very friendly staff and room was very clean. The beds were very comfortable also. We stayed on the 2nd floor which they recommended since it would be quieter. Only complaint is the very thin walls. We could hear our neighbors though out the whole stay. Early and late, we just turned up the TV. Did not get a chance to try the breakfast. We were about half hour to 45 minutes to downtown Chicago. Perfect location and would definitely stay there again. Thank you for being our guest and taking the time to leave us a review! We appreciate your kind words regarding your stay and are happy to hear we were able to provide you with a clean, comfortable stay. We look forward to serving you again soon. I enjoyed my stay and I will recommend this hotel to a friend. The breakfast was very delicious and well maintained. 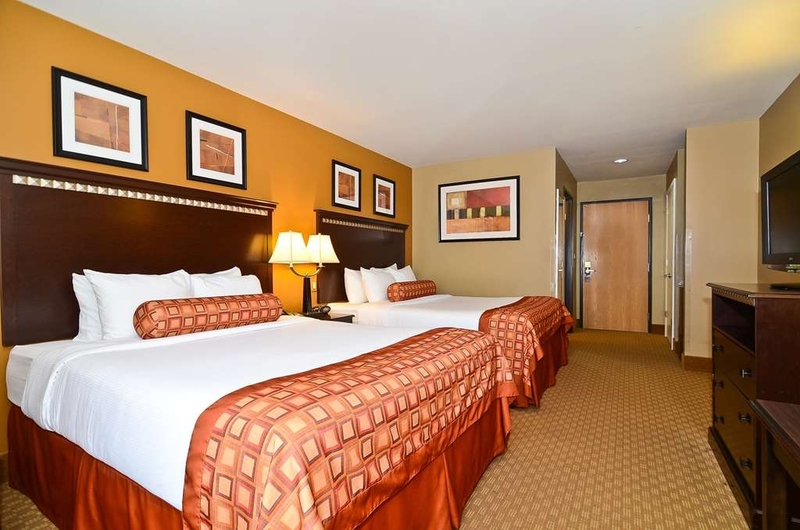 The hotel was very clean and the staff was extremely helpful. The manager at the location was very watchful of making sure the property was safe and sound. Thank you for taking the time to leave us a great review! 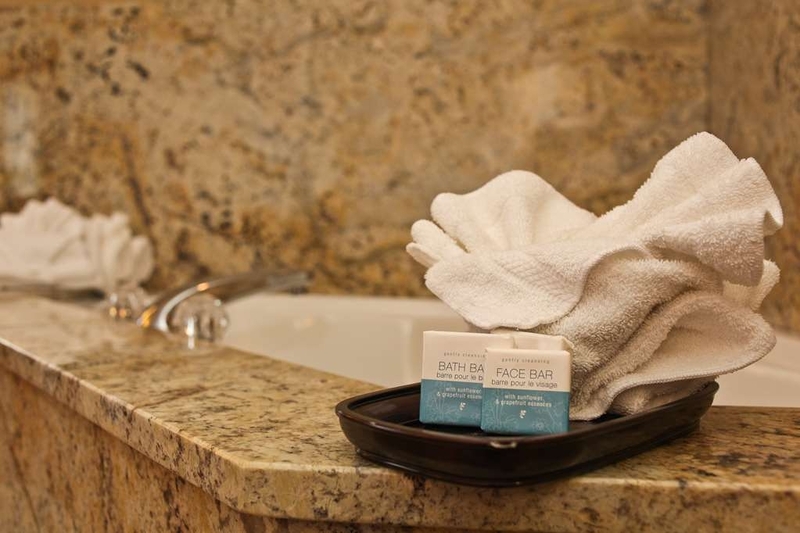 We are so happy to hear you enjoyed your stay with us and had a chance to use many of our amenities. 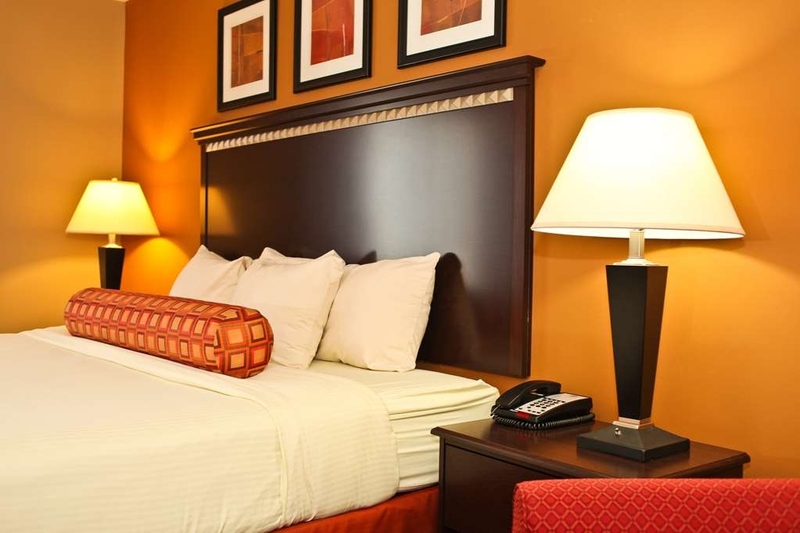 We strive to make sure all our guests are satisfied with their stay. We look forward to serving you again soon. "Inexpensive and near Gaelic Park." Ok, our team stayed here for the 2015 North American Gaelic Athletic Association Championships at Gaelic Park. This was the closest hotel (10 min away) and very reasonable at 119.00 a night. The pool and hot tub were a big plus and the staff was very accomdating and helpful. The hotel itself was clean, though the AC in our room was hit or miss getting pretty warm in the middle of the night. The hotel was safe, they have security in the lot and hotel at night, and I have to admit we gave them a little issue with noise and ruckus, but their security team handled it well. -Sorry about that. The Hotel is tucked away off an access road behind an industrial park and is a little hard to find.